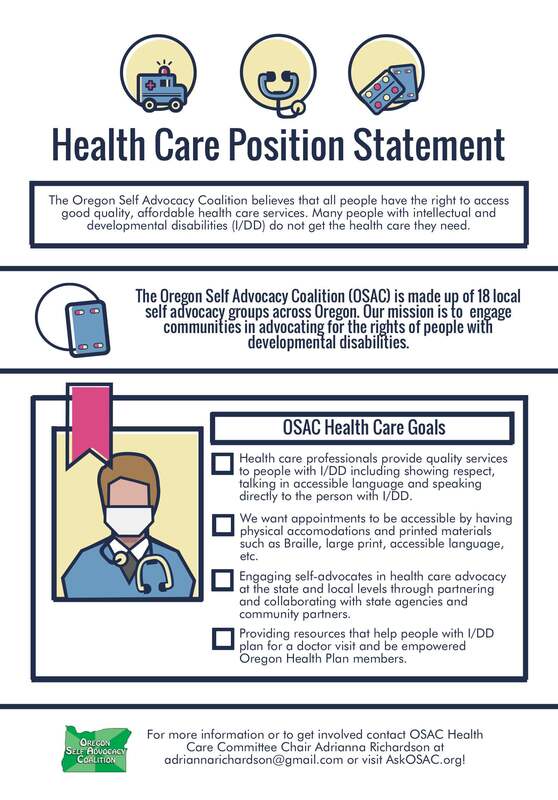 The Oregon Self Advocacy Coalition believes that all people have the right to access good quality, affordable health care services. Many people with intellectual and developmental disabilities (I/DD) do not get the health care they need. OSAC’s Health Care Committee meets by phone on the 4th Monday of every month from 11:30 am – 1:00pm. If you would like to join this group then email OSAC Health Care Committee Chair Adrianna Richardson at adriannarichardson@gmail.com. OSAC’s Health Care Committee has created a fact sheet to guide our work and to set goals for the year. Check it out below!